I have news for you folks: We're 100ish days until Halloween and that means it is time to get your pumpkin/gourd seeds into the ground. Based on the package, I'm actually a bit late, but with some care, I think I can get these guys up to speed. Since we're not eating any of the pumpkins/gourds I'm growing, I have no problem giving them a feeding or two of fertilizer to get the fruits nice and big. I have planted these in a totally different part of our yard. Totally separate from our vegetable garden both because of the above mentioned fertilizer, but also because of the bugs that these things draw. I want to be able to use some Seven on them if I need to and (although it says it is safe for vegetables that are being eaten), I prefer to not do that on the rest of our plants/fruits. 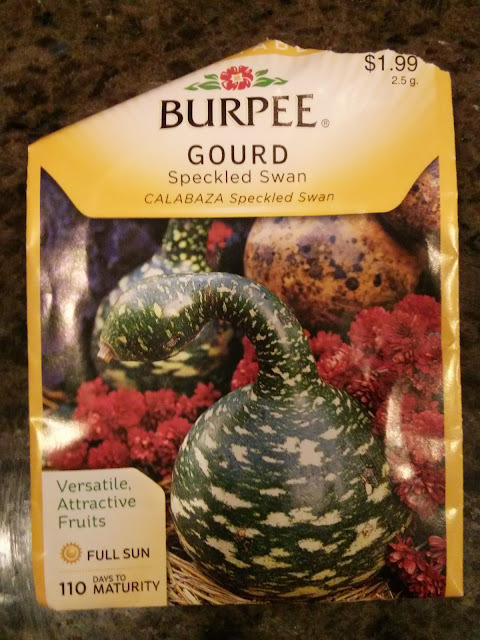 Having not grown this type of swan-neck gourd in the past, I have no idea how successful we'll be, but I figured it would be nice to have a few of these around come fall.